9 What will shape the supermarkets of the future? 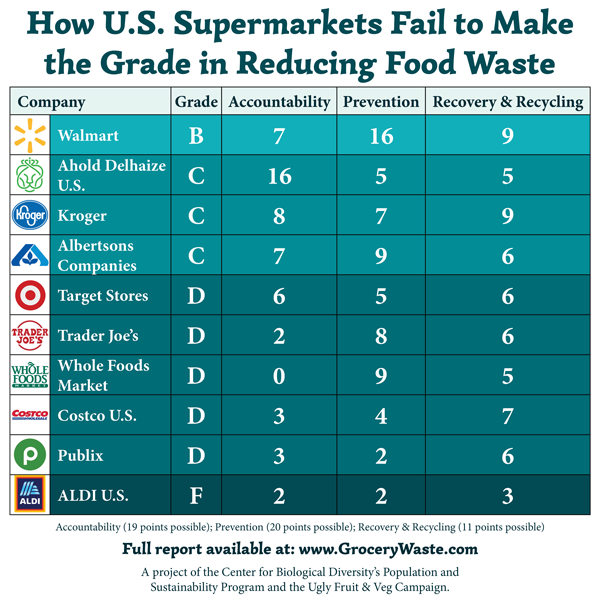 Supermarkets in the US are failing to make the grade when it comes to preventing food waste or publishing information about the current level of such waste in their food supply chains. 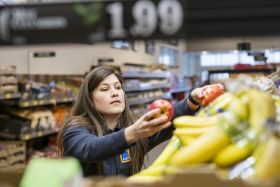 That’s according to a new report by the Center for Biological Diversity (CBD) and the Ugly Fruit & Veg Campaign, which found that nine out of the ten largest grocery chains in the US did not publicly report food waste volumes – the notable exception being Ahold Delhaize. While some of those chains have outlined their commitment to reducing food waste, the report suggested all of the major supermarkets were too focused on managing the excess product that existed rather than taking preventative steps to ensure it didn’t occur in the first place. It also noted the positive work carried out on food waste by UK-based group Tesco, describing it as having become “a global leader in reducing food waste in the grocery retail sector” thanks mainly to its emphasis on prevention and partnerships. • Nine out of the ten largest grocery companies in the US fail to publicly report their total volume of food waste. Ahold Delhaize was the only company that publicly reported its total food-waste volume. • The four companies that earned a C grade or higher overall (see table below) were the only ones with specific food-waste reduction commitments. Kroger leads the way with a commitment of zero food waste by 2025. • Four of the ten companies have no ‘imperfect-produce’ initiatives, which can prevent the waste of fruits and vegetables considered too ‘imperfect’ for retail sale. • Walmart was the only company with a variety of clear in-store efforts to reduce food waste, such as improving store fixtures, standardising date labels, and educating associates and shoppers. • All ten companies have food-donation programs, with the majority operating company-wide. Aldi was the only company that did not report a food-recycling programme (for example composting or a programme to re-use unsold food as animal feed or for other industrial uses). The report also recommended eliminating food waste in the grocery sector as a means to help improve public health. That challenge will need to be considered in the light of a separate report published by USDA scientists on the Plos One website this week, which found that US consumers with healthier diets that include more fresh fruit and vegetables are in fact wasting more food on average. With around 150,000 tonnes of food thrown away per day in the US, fruit and vegetables were identified by those USDA researchers as the most likely products to be discarded. However, the CBD report pointed out that the efficiency of food supply chains could also eventually be changed for the better if food waste were to be addressed more actively. According to the CBD, an estimated 40 per cent (62.5m tonnes) of the food produced in the US is wasted every year, costing households, businesses and farms around US$218bn each year. “Also wasted have been the resources that went into producing that food, including 25 percent of all fresh water consumed, 13 per cent of the total carbon emitted in order to produce food, and 80m acres of farmland used in the United States,” it noted.